Earlier in August, I was lucky enough to see Mr Iyengar a couple times. Exiting the institute around noon, we’d immediately notice him sitting on his front porch, directly facing the institute. Abhijata Sridhar, his granddaughter, would sit beside him. Some students approached with a bow and namaste; a few prostrated themselves and touched the ground below him. Most politely gave him space and privacy. Yesterday Abhijata taught the Wednesday women’s class, which is packed to the rafters since men are allowed to attend. With great energy and clarity, she led the class through basic poses–Tadasana, Sirsasana, Trikonasana, Ardha Chandrasana–that suddenly demanded full attention. I found her remarkably poised and articulate; nothing fazes her. She is commanding without arrogance. Her teachings combine precise asana instructions with straightforward yoga philosophy, and they are peppered with anecdotes of her grandfather. She initially asked, “Did you come here to learn, or did you come here to do?” It’s an excellent question to ask yourself before any class. Later, before Sirsasana, she talked about doing asana with sensitivity. About eight years ago, she set a timer for her headstand, aiming to hold the pose for 20+ minutes. The first few minutes were easy, and then one thing or another began hurting. As the minutes ticked by, she felt sweaty, itchy, and distracted, but forced herself to continue. At 20 minutes she came down and proudly announced her feat to her grandfather. “Then you wasted your time,” he said. We then rose into our own Sirsasana, which we held for almost 11 minutes! 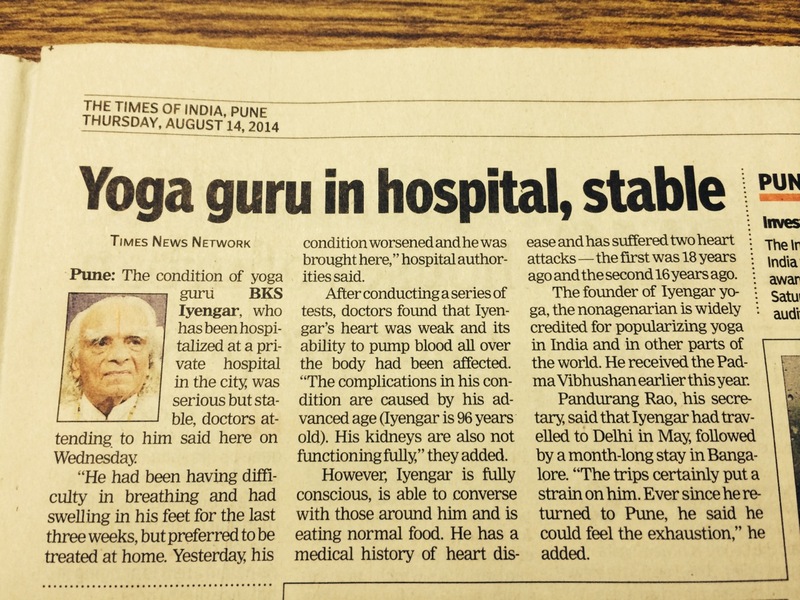 With neither Mr Iyengar nor Geeta around, I can’t help wishing I’d applied sooner. But some of the other teachers, such as Gulnaaz Dashti, are excellent. 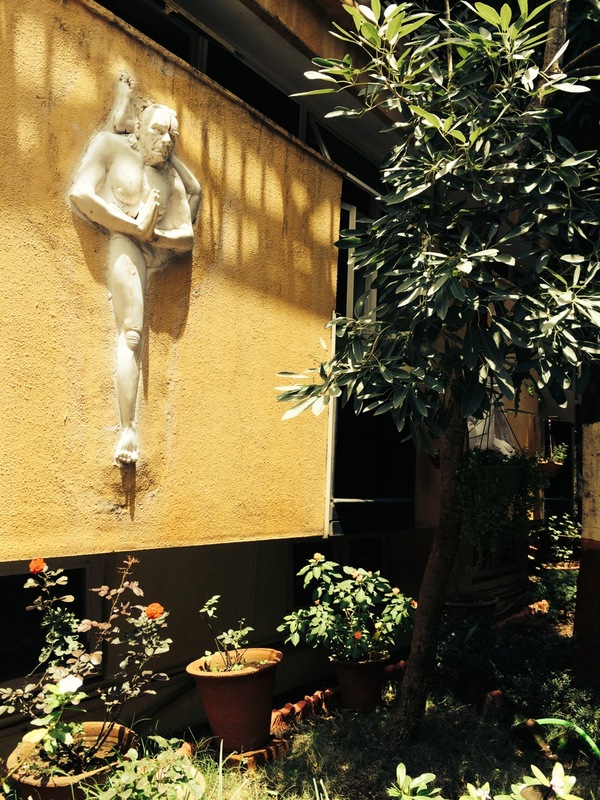 And if Abhijata is the next generation, Iyengar yoga has a promising future. It has been so nice hearing all the antidotes from this trip to India, it brings many memories back. John and I will miss you at Donald’s, know you will be in our thoughts during next week. If savasana is also a pose would “doing nothing” be an unreasonable answer? How do you go about doing nothing. Top secret mission for yogaspy: Investigate what instructors do during savasana, after talking has ceased. You, more than any official teacher, have spurred me to think and rethink Savasana, in my practice, in my teaching. Would the master find it humorous to see he is in the hospital stable? Hi Luci, I am sure it is an interesting time for you, being in Pune. All the very best to you and others. Please give my regards to the Kelowna group. I am also in Berkeley this summer, with Robin and others.